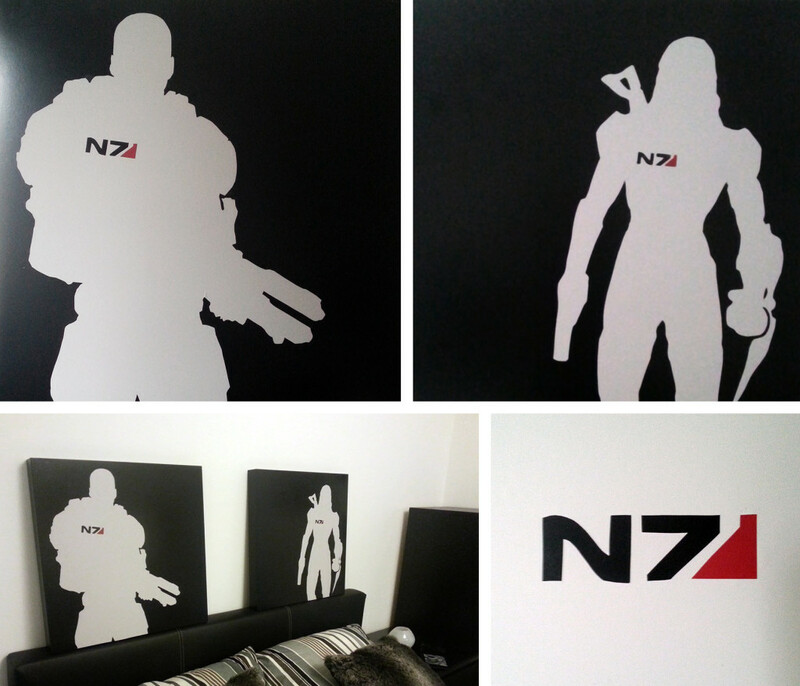 I’m very proud to have a Mass Effect – Wall deco already, but there are things you just can’t have enough of, right? This time I wanted to to have something for the empty wall in our bedroom. And here the theme has to be perfect, so we both will sleep well beneath it. But I am lucky to share many favourite games, movies and series with my sweetheart. And because we have so many many hours of playtime in the Mass Effect series, we decided to take this theme again. We’ve used two old IKEA tables (again), these have a size of 50x50cm. And we’ve used the official illustrations of our two beloved Shepards, which you can find on the posters or the special edition steelcases. I’ve traced the outlines and printed it enlarged (you can print it on 4 A4 sized paper sheets). These I’ve glued together and cutted out a gauge. With this you can easily transfer the figures on the adhesive foil. I’ve used light grey foil. For the N7 logo, I’ve cutted the “N” out of the light grey foil, to let the colour of the table shine through, for the “7” I’ve used red foil. The whole thing took me about 3-4h, but it’s something for the patient ones among you!